Platinum provides a number of benefits to investment portfolios. Including all three precious metals means portfolios can achieve full diversification within the precious metal group and experience reduced volatility, thereby improving overall performance. Although there are other precious metals such as palladium, rodium and iridium, only gold, silver and platinum have dual roles as monetary assets as well as industrial commodities. While many investors think of precious metals as merely commodities, their monetary roles can at times be the driving force for price increases. 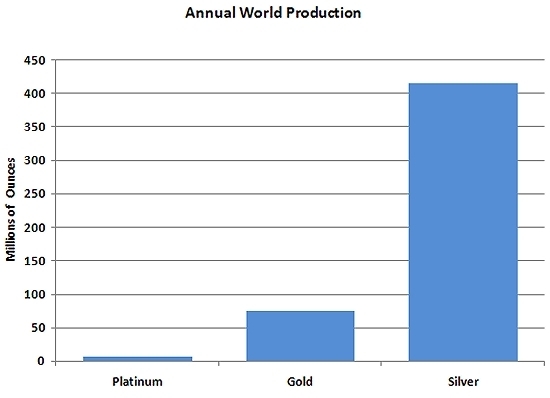 While gold and silver have been used as money for over 3000 years, platinum is a relative newcomer. The first platinum coins were issued in Russia in 1828. Over the next 18 years, the Russian government minted over 500,000 ounces of platinum and introduced to the notion that platinum was not just a commodity but, like gold, also a store of value. Today most mints offer gold, silver and platinum coins. All three metals have the necessary attributes to function as money. Platinum’s name comes from the Spanish expression for “little silver”. The Conquistadors first introduced platinum to Europe when they brought it back, along with plundered gold and silver, from the New World. During the nineteenth century platinum became much sought-after for jewellery, and was the metal of choice for many royal houses. Platinum is the rarest of the precious metals and its price reflects this. It takes a massive amount of ore – approximately 10 tonnes – to produce a single ounce of platinum, and the extraction and refining processes are both costly and time consuming. Excavating ten tonnes of ore takes 6 months of labour-intensive mining, often in dangerous conditions at mines that can be several miles deep. Total annual world production is about 7 million ounces, a mere 10% of the world’s annual gold production of 76 million ounces, and less than 1% of the world’s annual silver production of 416 million ounces. All the gold ever mined would fill an area the size of a 3-metre high tennis court, while all the platinum ever mined would hardly fill 25 cubic feet, or the size of a crate used to ship automobiles. While the media is starting to notice that gold and silver have jumped to new 25-year highs, there has been little or no mention of platinum, even though its rise has been even more spectacular. On November 21, 2006 platinum soared to an intra-day high of $1,350 per ounce, smashing through its previous all-time high of $1,070 reached in 1980. In contrast, the previous highs attained by gold and silver ($850 and $50 respectively) are still some way off. 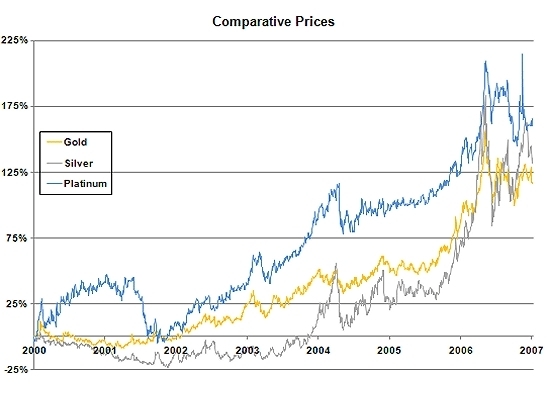 Also largely ignored is the fact that platinum’s percentage increase of 190% from the beginning of 2000 has surpassed silver’s 150% rise and gold’s 120% rise. Surprisingly, there is little or no mention of platinum prices in the mainstream press. 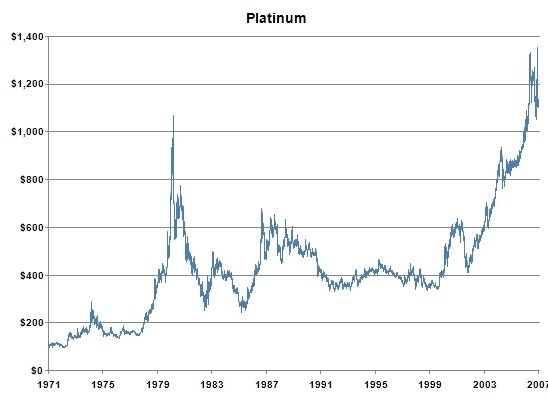 Even though platinum has surpassed its 1980 high in nominal terms, it still has a long way to go before reaching its inflation-adjusted high of $2,630. 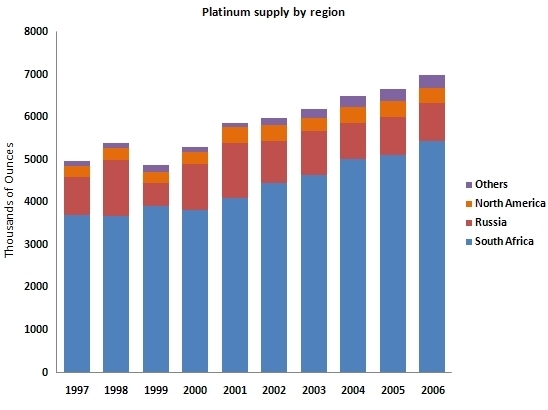 Since demand for platinum applications keeps growing while mine supply remains relatively fixed, the price of platinum is likely to exceed that inflation-adjusted high. The quiet bull market in all three precious metals – gold, silver and platinum – is important to investors. A portfolio cannot be fully diversified if it only contains a mix of stocks, bonds and cash because, since 1969, stock and bond correlations have been increasing. Precious metals are the most negatively correlated asset class to traditional financial assets such as stocks and bonds. When they fall, precious metals tend to rise and vice versa, so precious metals act like portfolio insurance. Today, every portfolio benefits from an allocation of at least 5% to precious metals in order to reduce volatility and risk. 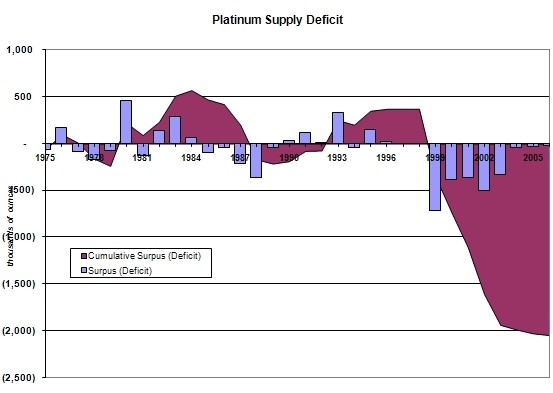 Platinum is in a secular bull market strongly supported by supply/demand fundamentals. Supply is limited and hard to excavate. Total world reserves that can be economically mined are estimated at 3.5 billion ounces by the US Geological Survey. Unlike all other metals and oil, platinum deposits are limited to only two main areas of the world. Due to the distinctive characteristics of platinum deposits, geologists consider it unlikely that significant new resources will be found. South Africa and Russia are the richest sources, with South Africa accounting for about 78% of total annual world production, and 63% of the world’s reserves. Russia accounts for about 13% of total annual world production. North and South America are less important sources. Unlike gold, there are no large above-ground supplies of platinum. Any interruption of mine production, because of political instability or labour turmoil, for instance, would catapult the price into orbit. The cost of mining in South Africa has climbed recently because of strength in the rand, and the increased cost of oil. Russian production suffered during the transition period before and after the collapse of the Soviet Union, but new investment in modern plants and equipment could dramatically boost output. Demand for platinum has increased from about 2.6 million ounces in 1975 to 7 million ounces today. Unlike gold, over 50% of the platinum produced is consumed (destroyed) in industrial applications. Platinum is indispensable for many industrial uses because of its unique physical and chemical characteristics, which make it suitable for many different applications. Platinum’s catalytic properties, inertness, durability, electrical conductivity, and high melting point are useful in a variety of industrial applications, while its rarity, strength, and beauty make it a popular choice for jewellery. Demand for platinum is inextricably linked to economic growth, so future demand from emerging economies will likely challenge current production capacity. Approximately 30% of products manufactured today either contain platinum or use it in production. Platinum is used as a catalytic agent in the processing of nitric acid, fertilizers, synthetic fibers and a variety of other materials. It can be recycled following the catalytic process, making demand somewhat volatile. However, platinum is an essential ingredient for many catalytic processes and there are few satisfactory substitutes. New uses for platinum in electronics are discovered almost daily. Currently, it is used in thermocouple devices that measure temperature with high accuracy; thin-film optical coating and temperature systems; wires and electrical contacts for use in corrosive or high-voltage mediums; magnetic coatings for high density hard disk drives and some of the new optical storage systems. Platinum is used extensively in glass production, because its hardness and high melting point make it ideal for difficult high-temperature processes. It is also widely used in fiberglass production. The recent introduction of glass fiber communications technology is a new and powerful driver for demand. Although glass production is currently a relatively small component of total demand, it is a high-growth area. Crude oil refining is a growth area for platinum, alongside economic expansion in Asia. While other technologies that perform crude oil separation do exist, the processes using platinum are the most environmentally friendly. As new refineries are constructed and older one are updated, platinum use in petroleum refining will rise accordingly. Platinum’s scarcity and beauty make it top choice for expensive jewellery. Its hardness and durability mean it can be used in extremely pure form, resulting in more secure stone settings. It resists oxidation and discolouration. Its brilliant luster makes diamonds in particular more luminous, but also enhances the beauty of all precious stones. Platinum is hypoallergenic, making it the metal of choice for those who suffer reactions to other materials. 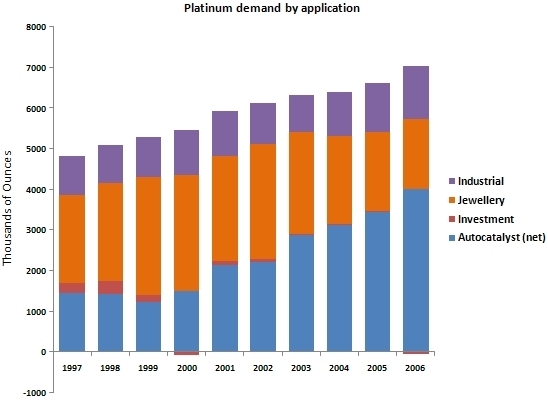 Platinum, along with palladium, is in great demand by the auto industry, which soaks up 33% of annual supply. Since 1999 auto catalyst demand has more than doubled, largely because platinum has a unique ability to control and remove harmful engine emission by-products. The importance of platinum within the auto industry will continue to grow as governments around the world worlds ecologically responsible governments demand greater levels of emission control, and future demand could increase exponentially, along with price. Diesel engines, already extremely common in Europe and Asia, are becoming increasingly popular in North America. Currently only platinum can be used for diesel auto catalysts, and only platinum can be used in third-world countries where sulphur levels in the fuel exceed acceptable limits. Diesel cars now account for more than 50% of the market in Europe, where many models include soot filters that employ platinum as well as oxidation catalysts. European auto catalyst demand is expected to increase by 15% to 2.25 million ounces in 2007. In North America many light diesel trucks will have catalysts fitted for the first time in 2007, and platinum use in larger trucks is also expected to increase. Platinum consumption by North American automotive industries is expected to rise by 5% in 2007 to 1.5 million ounces. Manufacturers are experimenting with fuel cell power plants for electric cars, creating a new use for platinum that could substantially increase demand. Fuel cells use platinum to catalyze a chemical reaction using hydrogen that creates electrical energy, but generates no harmful emissions. According to recent data from Platinum Today, the vast majority of investors ignore precious metals entirely, and hold portfolios that are not diversified and are therefore exposed to economic downturns, financial crises and inflation. Of the investors who do have an allocation to precious metals, most concentrate on gold, while a few more include silver. Many believe that an allocation to mining stocks provides the required diversification. Although mining stocks often track the price of the metals, there are times, such as during the market decline in 1987, when mining stocks decline by a greater margin than the broad equity markets even as the price of gold rises. Consider that, in the 1970s, the price of gold itself outperformed Homestake Mining shares by a factor of two. Few investors have an allocation physical platinum, the best-performing precious metal. Where platinum is concerned, there are few stocks to choose from. The major producers are South African stocks such as Impala Platinum, and Anglo-American Platinum. North American producers such as Stillwater Mining and North American Palladium are primarily palladium producers with some by-product platinum production. According to a study by Wainwright Economics, a Boston-based investment research and strategy firm, platinum is the leading indicator of inflation. While gold and silver lead inflation by 12 months, platinum leads by 16 months. This was confirmed in the current bull market as the rise in platinum prices started in 1999, while gold and silver’s rise began in 2001.